Welcome to the Edmonton Oilers Community Foundation 2018 Hockey Fights Cancer Charity Auction in support of the Kids With Cancer Society. 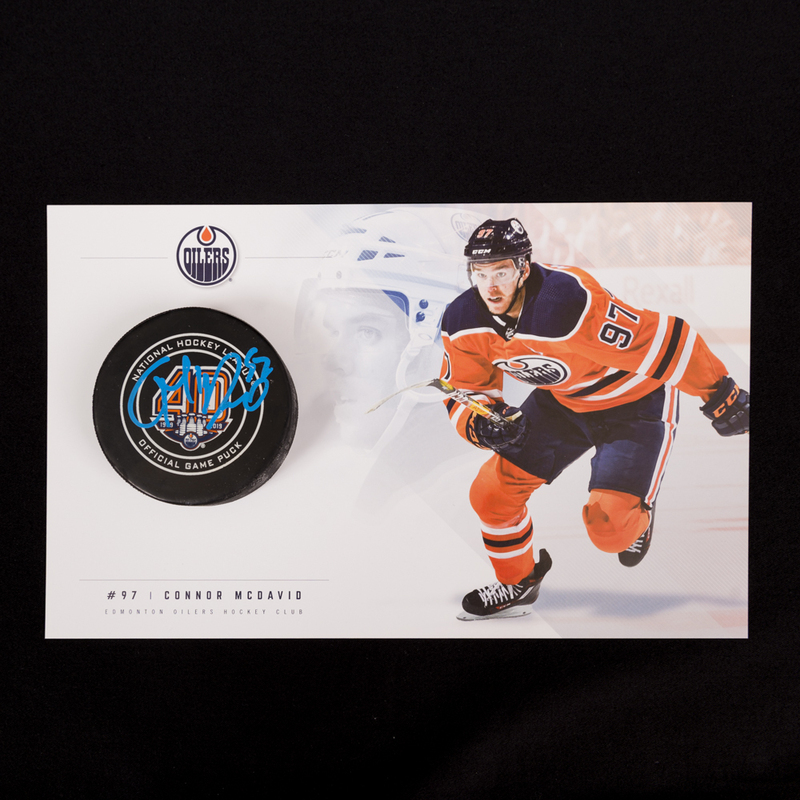 Show your support in the fight against cancer by bidding on this Connor McDavid #97 - 92nd NHL Career Regular Season Edmonton Oilers Goal Puck Scored On October 23, 2018 vs. the Pittsburgh Penguins - Includes Oversized Player Card. On this night the Oilers fell to the Penguins 6-5 in over-time on home ice at Rogers Place. McDavid scored his fifth goal of the season and 92nd of his NHL career at the 2:47 mark of the third period. Assists were awarded on the play to #77 Oscar Klefbom and #27 Milan Lucic. Following the goal this official Edmonton Oilers NHL Game Puck was provided directly to off-ice officials who promptly labelled it with the details of the goal on a custom made puck label which was then applied to the back of the puck. It was then given to Edmonton Oilers equipment staff immediately following the game for donation to our online auction. This great goal puck has been autographed by Connor McDavid and will come complete with a Letter of Authenticity from the Edmonton Oilers Hockey Club and Edmonton Oilers Authentic Inventory Hologram applied to the back of the puck. Last but not least, to finish off this great auction lot we will also include the Connor McDavid oversized player card as shown in the auction listing picture.